The ZIP contains ATR-based flashers (using a modified version of the SDX flasher) for SIDE and SIDE2. Boot the ATR which corresponds to your hardware, being careful not to flash an original SIDE cartridge on an Ultimate 1MB equipped machine (U1MB flash corruption can occur). SIDE2 does not conflict with U1MB, so may be updated safely on Ultimate equipped machines. Also in the ZIP is a copy of the 256KB padded ROM, should you have a RAM expanded machine and wish to use UFLASH to flash the ROM to the ‘External Cart’ section of your SIDE or SIDE2 cartridge. 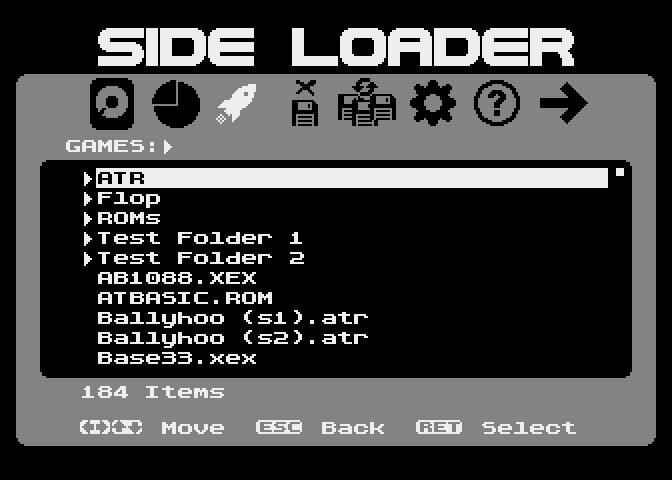 See the XEX Loader section in the U1MB/Incognito firmware manual for details of how to use the new loader.